With ESX/ESXi is possible have several information from the physical hardware (with CIM) and this could be enough in most cases, especially for monitoring (with hardware health) and to gain some inventory info (like the Service Tag of a server). But for some specific tasks (like a RAID rebuild o check of the local storage, or have a detailed inventory of the physical RAM banks) is necessary use the specific native tool from the hardware vendor. For Dell servers, the tool is called OpenManage Server Administrator (OMSA) and the current version is 6.5. It is available for several platforms of operating systems (in case of physical servers) or hypervisors (included VMware ESX/ESXi, XenServer and Hyper-V). See VMware Virtual Networking Concepts for basic concepts for standard virtual switches. See Objective 2.2 – Configure vNetwork Distributed Switches for distributed virtual switches. Use previous links. For vmkernel porgroup vmkping can help in network tests (remember to use -d option to test large packets like, for example, Jumbo Frames). Remember that each pNIC act as an uplink, so the relative pSwitch port must be configured in the same of others in the same vSwitch. Mix of different NIC adapters is permitted. Mix of different speed could be possible, but can create performance issues. For IP hash team policy a specific configuration is required on the pSwitch. Beacon probing make sense only with at least 3 pNIC. A top-down or bottom-up approach though the network layer could be useful. Also a packet trace in the network could help (see Using a Network Packet Analyzer on a VMware vSphere Virtual Network and VMware KB: Capturing a network trace in ESXi using Tech Support). See the vSphere Troubleshooting guide. For Audodeply see the vSphere Troubleshooting guide (page 20). For other installation is most similar to old version and remember to check requiments and HCL. 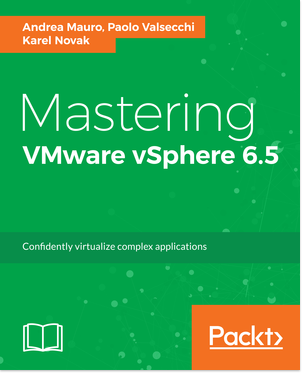 See the vSphere Monitoring and Performance Guide (page 25). See the vCenter Server and Host Management Guide (page 95). See also: Objective 5.6 – Patch and Update ESXi and Virtual Machines. Each piece of software need to be patched for different reasons… but the most important are usually the security reasons. For ESXi a patch need that the host is put in maintenance mode and require a host reboot after the patch operation. All those operations can be orchestrated by VUM. For VMware Tools a new version is usually related to a new major release or also of some update (in most cases related to vmkernel update). On most guest OS (like Windows) a VMware Tools patch need a VM reboot. All those operations can be orchestrated by VUM. 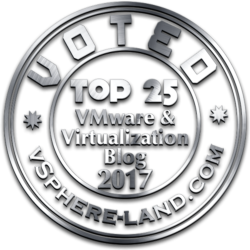 For VM virtual hardware this upgrade is related to new major relases (for example with vSphere 5 the new virtual hardware is v8 ) e richiede di fatto due riavvi della VM. It require first the VMware Tools upgrade, and usually two VM downtime. All those operations can be orchestrated by VUM. See the vSphere Host Profiles Guide (page 8). Usually you can start from a base ESXi and use it as a template. See the vSphere Host Profiles Guide (page 12). See the vSphere Host Profiles Guide (page 16). See the Installing and Administering VMware vSphere Update Manager guide (page 31). Note that you can install or upgrade the Update Manager server on 64-bit operating systems. Even though Update Manager runs on 64-bit operating systems, it is a 32-bit application and requires a 32-bit ODBC DSN. See the Installing and Administering VMware vSphere Update Manager guide (page 66). See the Installing and Administering VMware vSphere Update Manager guide (page 81). See the Installing and Administering VMware vSphere Update Manager guide (page 95). See the Installing and Administering VMware vSphere Update Manager guide (page 99 and 115). Note that Update Manager 5.0 does not support virtual machine guest patch operations. See the Installing and Administering VMware vSphere Update Manager guide (page 119). At the BUILD developer conference during this week, Microsoft demonstrated the new version of Windows products (and some related products, like Hyper-V and PowerShell). It is not clear if both the client and the server OS will be released at the same time (rumors say during 2012) and if they have also the same name. But I suppose that the Server OS will use the same naming of previous (so maybe Windows Server 2012?). One curios thing is that Windows 7 and 8 are not related to their NT kernel versions: Windows 7 is just a NT 6.1 and Windows 8 is just a NT 6.2… so not new architectures but more similar to an evolution of the NT 6.0 (Vista) architecture. 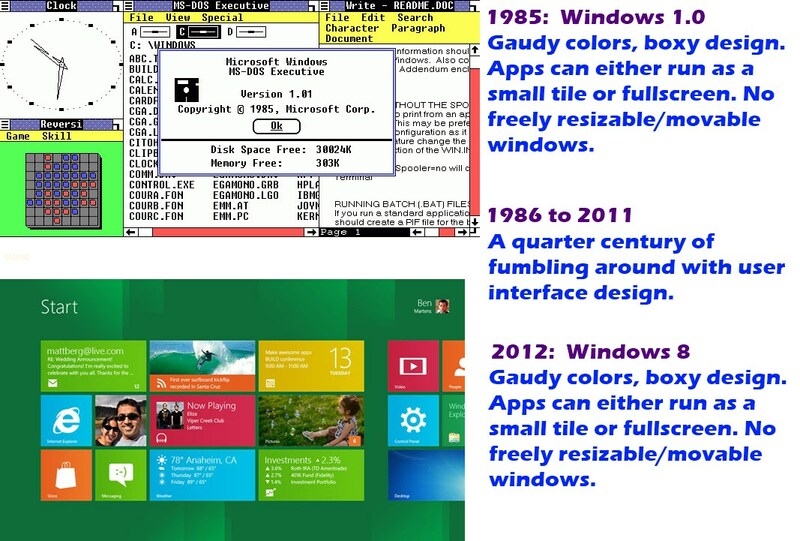 In fact, except the new Metro UI (and the MSIE 10), Windows 8 seems quite similar to Windows 7. The Metro UI is the new controversial interface tile based, similar to the one used on Windows Phone 7. For a tablet could probably be good a solution, but for a traditional PC with keyboard and mouse is just a nice home screen with a limited usability. About the revolution (or evolution) of this GUI, this image synthesize is a funny way the difference between Windows 1.0 and Windows 8. Windows 8 is available as a developer preview on MSDN both in 32 and 64 bit editions (so seems confirmed that the rumored 128 bit was a fake). A VM installation require VMware Workstation 8 or Fusion 4, or (maybe?) vSphere 5 (with this note, but http://kb.vmware.com/kb/2006859 say a different thing) or XenServer 5.6U2 (Running Windows 8 Developer Preview in a virtual environment). Honestly in a VM isn’t too much fast in the boot and shutdown procedure (but this a developer edition). But from the OS works good and seems quite ready. See also some screenshots (not mine). See also the new bluescreen screenshot (Even the Windows 8 Blue Screens have been re-imagined! ), this happen if you try to install Windows 8 in a VM on a unsupported hypervisor. Also Windows Server 8 is available as a developer preview on MSDN. With 300 new features that include significant improvements to system-level virtualization, along with a raft of virtualized networking, storage and management capabilities. Apart the Hyper-V 3 related features, one interesting aspect could be the deduplications in NTFS as also the ability to turn on and off the GUI, basically providing Server Core, with a GUI on demand when needed (but will replace the Server Core?). Probably this is the area with most new features. First to all seems that will available also for the Client OS (Bringing Hyper-V to “Windows 8”). This will open some interesting questions about the role of Windows Virtual PC (is suppose that it will dropped) and how XP-Mode and MED-V will be implemented now. 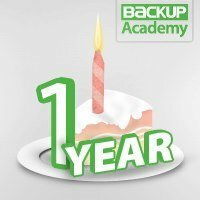 Veeam has start a free community educational resource site: Backup Academy. This site provides training on basic principles of virtualization and data protection. These basic principles are presented in a product-neutral fashion, meaning that there are no specific backup products mentioned. The only time specific products are mentioned is when the hypervisors (VMware ESXi, Hyper-V) are mentioned, as well as specific guest operating systems and applications that we need to protect as IT professionals. See the official announce: Backup Academy: Free data protection training & certification for virtualization. As you can see the blog name has changed from Virtual Infrastructure to vInfrastructure, and also the URL has changed from http://virtual-infrastructure.it to the short one http://vinfrastructure.it. But don’t worry, the contents remain the same (and will grow again) and the previous links will still work. Dell Equallogic has recently released new versions of some software. Note that those release are Early Production Access (EPA) version. Early Production Access software is fully supported for production use, but customers should read the documentation and plan an upgrade in keeping with their organization’s business practices. A new method for managing ACL policies is available from the Manage ACL Policy wizard. This wizard can be selected from Auto-Snapshot Manager/VMware Edition (ASM/VE), EqualLogic Datastore Manager, and the Virtual Desktop Deployment Utility. See also: Objective 5.5 – Backup and Restore Virtual Machines and Objective 5.5 – Backup and Restore Virtual Machines. See the vSphere Virtual Machine Administration Guide (page 208) and VMware KB: Understanding virtual machine snapshots in VMware. Note that snapshots provide a point-in-time image of the disk that backup solutions can use, but Snapshots are not meant to be a robust method of backup and recovery. If the files containing a virtual machine are lost, its snapshot files are also lost. Also, large numbers of snapshots are difficult to manage, consume large amounts of disk space, and are not protected in the case of hardware failure. See the vSphere Virtual Machine Administration Guide (page 209 and 216). Can also be done from the vSphere Web Client. The consolidate operarion, instead, is a new feature of vSphere 5. Snapshot consolidation is useful when snapshot disks fail to compact after a Delete or Delete all operation or if the disk did not consolidate. This might happen, for example, if you delete a snapshot but its associated disk does not commit back to the base disk. For more info see the vSphere Virtual Machine Administration Guide (page 218). See the VMware Data Recovery Administration Guide (page 13). For more info about VDR see also: VMware Data Recovery (VDR) as a backup solution. See the VMware Data Recovery Administration Guide (page 26). Note that now is possible use email notification and have a different time window for “maintenance” activities (like integrity check). See the VMware Data Recovery Administration Guide (page 31 and 33). VMware provide only VDR (in all edition exept the Essential bundle), ad a backup product, and a set of vStorage API (the VADP subset) to integrate 3rd part backup programs. Note that in vSphere 5 VCB is no more available. See also: Objective 5.4 – Migrate Virtual Machines and Objective 5.4 – Migrate Virtual Machines. See the vSphere Virtual Machine Administration guide (page 219) and vCenter Server and Host Management guide (page 119 and 122). Some basic requiments: for vMotion a specific vmkernel interface (enabled for vMotion) is required, as the CPU compatibility (or EVC). For Storage vMotion the host must see both source and destination datastore. See the vCenter Server and Host Management guide (page 123) and VMware KB: Enhanced VMotion Compatibility (EVC) processor support. More baselines are available. Reverting to a snapshot after migration with vMotion might cause the virtual machine to fail, because themigration wizard cannot verify the compatibility of the virtual machine state in the snapshot with the destination host. Failure occurs only if the configuration in the snapshot uses devices or virtual disks that are not accessible on the current host, or if the snapshot contains an active virtual machine state that was running on hardware that is incompatible with the current host CPU. The starting and destination hosts must be running ESX 3.5 or ESXi 3.5 or later. All of the virtual machine files and disks must reside in a single directory, and the migrate operation must move all the virtual machine files and disks to a single destination directory. See the vSphere Virtual Machine Administration guide (page 223) and vCenter Server and Host Management guide (page 132). Can also be done from the vSphere Web Client. among all concurrent migrations with vMotion. vCenter Server grants a larger share of host CPU resources to high priority migrations than to standard priority migrations. Migrations always proceed regardless of the resources that have been reserved. On hosts running ESX/ESXi version 4.0 or earlier, vCenter Server attempts to reserve a fixed amount of resources on both the source and destination hosts for each individual migration. High priority migrations do not proceed if resources are unavailable. Remember that the Storage vMotion of virtual machines during VMware Tools installation is not supported. See the vCenter Server and Host Management guide (page 121). See the vSphere Virtual Machine Administration guide (page 220). Can also be done from the vSphere Web Client. When you migrate a suspended virtual machine, the new host for the virtual machine must meet CPU compatibility requirements, because the virtual machine must be able to resume executing instructions on the new host. See the vSphere Virtual Machine Administration guide (page 226). During a Storage vMotion or also a cold storage migration all files are renamed with the current VM name. The vmdk can be change from thin to flat or viceversa. For virtual compatibility mode RDMs, you can migrate the mapping file or convert to thick-provisioned or thinprovisioned disks during migration as long as the destination is not an NFS datastore. If you convert the mapping file, a new virtual disk is created and the contents of the mapped LUN are copied to this disk. For physical compatibility mode RDMs, you can migrate the mapping file only. 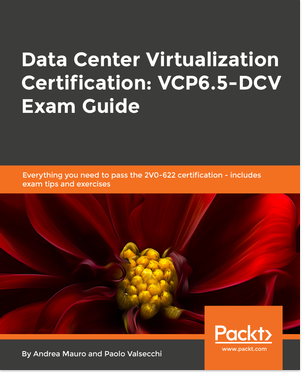 Recently, has been released the VCP5 blueprint 1.2 that cover the official exam (note that the v1.4 was related to the beta exam). The new blueprint does not include changes on the objectives, and is the as the 1.1 version (just a little changes in the graphics).